Hugging the top of an incredibly tall ficus tree with my entire body out of a beautiful combination of extreme happiness and terror is the newest addition to the list of things I never thought I would do. I am completely enamoured with rock climbing, but I have never been one to climb trees. People typically seem to get into that around age 6 or 7, and when I was that old, I was far too physically cautious to venture past the first couple branches. Every time we go to Santa Elena, a town about a 30 minute drive from campus with a handful of restaurants and markets, the view out to the ocean miles and miles away is captivating, and I can’t help but stick my head out the window to feel the wind and to get as close to it as I can. On our second-to-last trip to town, my friend Alejandro and I met a couple of friendly, dreadlocked hippies selling beautiful stone, gem, and thread bracelets. One man, speaking in rapid Spanish, told Ale about a huge ficus tree which we could climb and see the entire area and out to the ocean from the top branches. Immediately after Ale told me what he had said, I became fixated on the idea. On our last trip to town, after an essential coffee stop, we headed out to the tree with our South African friend Emma. We asked for directions two or three times, headed up huge hills and turned down a non-descript dirt pathway into what looked a little more like the forest than the town. 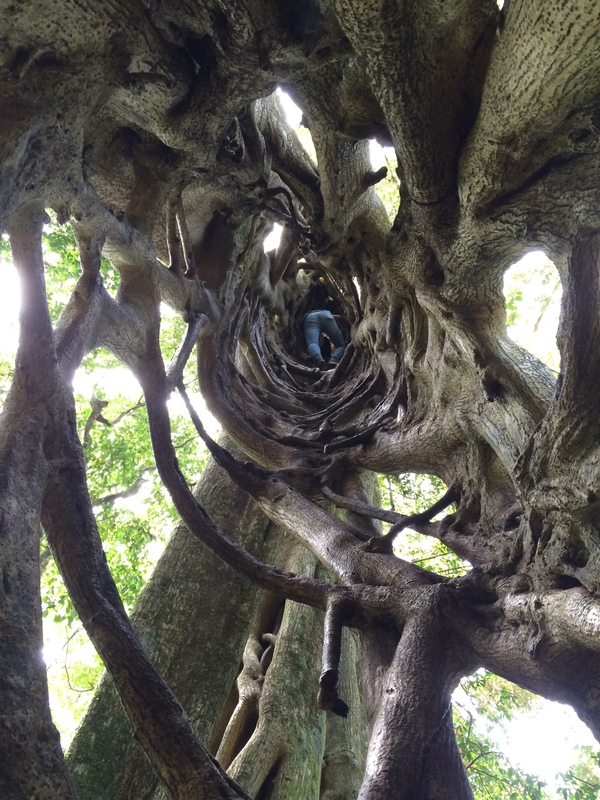 When we finally came upon the tree, we realized that it didn’t have climbable branches — rather, it was adorned with a gigantic strangler fig that had grown and morphed into a natural ladder. 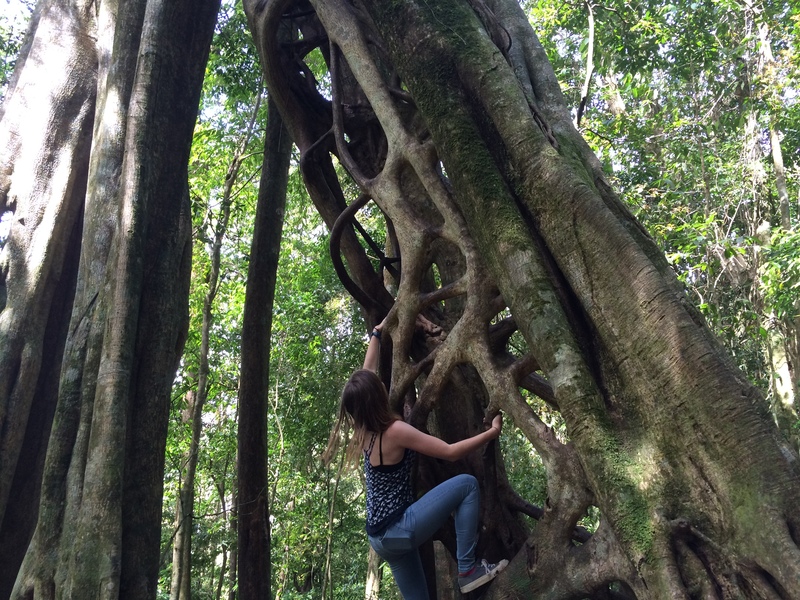 We only needed to climb inside the strangler fig in order to access the path up to the top of the tree, and with careful movements, we placed our feet in the natural footholds and wrapped our arms around the branches, lifting ourselves up further and further towards the top of the tree. Looking through the holes of the strangler fig quickly became more and more exciting, and, simultaneously, anxiety-inducing. 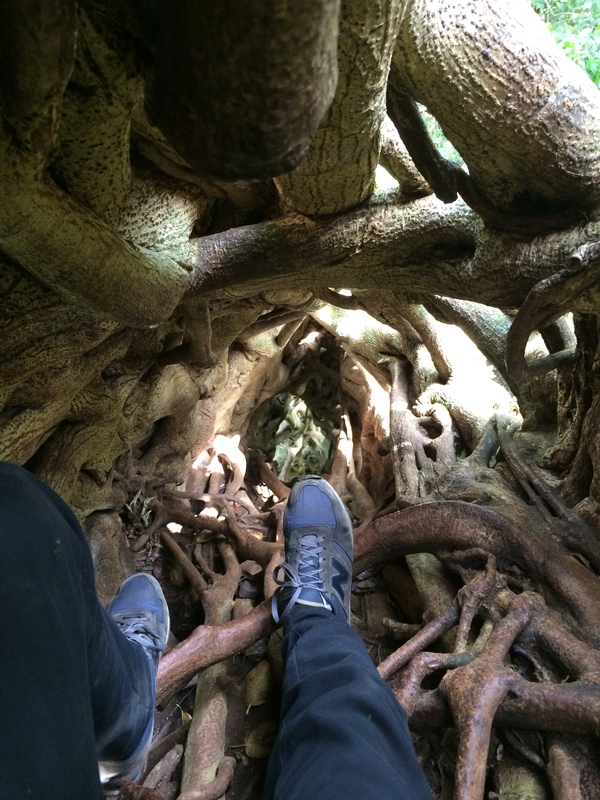 When we reached the top, the strangler fig was so narrow that we were crawling on our knees. Sticking my head out of the strangler fig, I was greeted by the uppermost branches of the tree, and after climbing out, the most spectacular view. I breathed shakily, taking in the sheer insanity of being alive in this strange place, and feeling wonderfully insignificant. Leaning against the tree, I was the happiest I’ve been in the longest time, feeling one with nature, despite the cliché. So often we forget that we are not separate from the natural world as humans, and climbing to the top of the tree reminded me, as so much has recently, to be grateful for our place on this beautiful Earth.